County Clare Fleadh Cheoil 16-20 June 2011 - Kilfenora, County Clare, Ireland. For the third successive year, the Co. Clare Fleadh Cheoil was held in Kilfenora, one of Ireland’s villages most famed for its music from 16-20 June 2011. 2011 was also the 60th anniversary of the Comhaltas Ceoltóirí Éireann, the traditional music society of Ireland which manages the fleadhanna. Competitions for solo and group performers was staged on Saturday and Sunday, 18-19 June. As always in Clare, we expect the standard to be extremely high and, as in previous years, we hope that some of our winners will emerge as All-Ireland champions. 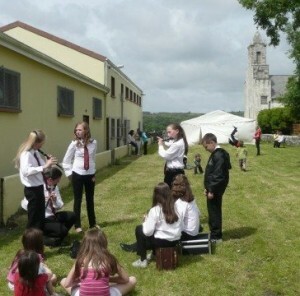 Alongside the competitions, other musical events included céilís with top Irish bands. In addition there was sessions in the pubs daily including Monday, featuring many of Clare’s finest musicians, and also the celebrated Singers’ Night on Friday 17 June (Linnane’s). Finally, there was a concert, one of the Riches of Clare events staged around the county, on Friday at 1.00 pm in the magical setting of the old cathedral church. The featured musicians will be Kilfenora’s own Noel O’ Donohue and James and Anthony Devitt, with Corofin piano maestro Padraic O’Reilly. See www.richesofclare.com for more details of concerts and a free promotional CD.